Score a shine-free face with the right makeup. If you're prone to oily skin, getting the matte makeup look can be a real challenge. Even if you painstakingly apply foundation and powder, your makeup can slide off by the end of the day. You can't keep reapplying your cosmetics as soon as they disappear, so the best plan of action is to fight back against your oily skin. Win the battle by combining an anti-shine cleaning routine with an arsenal of mattifying beauty products. Wash your face in the morning before applying makeup. Use warm water and a gentle soap or cleansing product. For more oil-fighting power, use a cleanser that contains salicylic acid, glycolic acid or niacinamide. Pat dry with a washcloth after cleansing. Wash again just before you go to bed. Clean oily skin with an exfoliating scrub twice per week. To make your own scrub, combine 1 tablespoon of olive oil, 1 tablespoon of honey, 1/2 cup of granulated sugar and the juice of a lemon half. Mix the ingredients into a paste. Apply the scrub to your face with gentle circular motions. Leave it on for up to 10 minutes, then rinse. Massage a few drops of oil-free, mattifying primer into your forehead, cheeks, nose and chin. You don't need much to cover a large area -- a little goes a long way. Primer helps keep your makeup in place even if your face gets a bit oily or sweaty. It's vital to an all-day matte look. 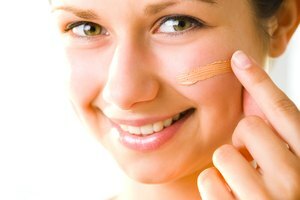 Apply a tinted BB cream or moisturizer instead of a heavy liquid foundation. Thick foundation might make your skin look more oily and shiny. Lightweight moisturizers don't clog your pores, so your skin looks less oily. Dust your face with a lightly tinted or translucent finishing powder. A clay or mineral powder works well at covering up blemishes and keeping your skin oil-free. 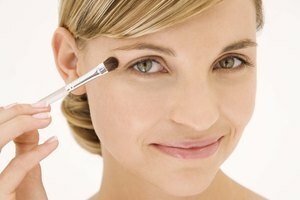 To apply powder, use a large makeup brush. Dip the brush bristles into the powder, shake off any excess and then swirl the powder onto your face. Dab your face with a sheet of blotting paper if it starts to look oily during the day. Blotting paper absorbs oil without messing up your makeup. To use, gently press a sheet of the paper against your skin. Hold it there for a few seconds, then pull it away. You'll see the oil that transferred from your face onto the paper. Apply a clay mask once per week if you have a very oily face. The clay absorbs oil and helps tighten pores. Don't wash your face more than twice per day. Too much washing irritates your skin and strips away the natural oil your face needs to look good. King, Melissa. "How to Have a Matte Face All Day." Synonym, https://classroom.synonym.com/matte-face-day-9311.html. Accessed 18 April 2019.